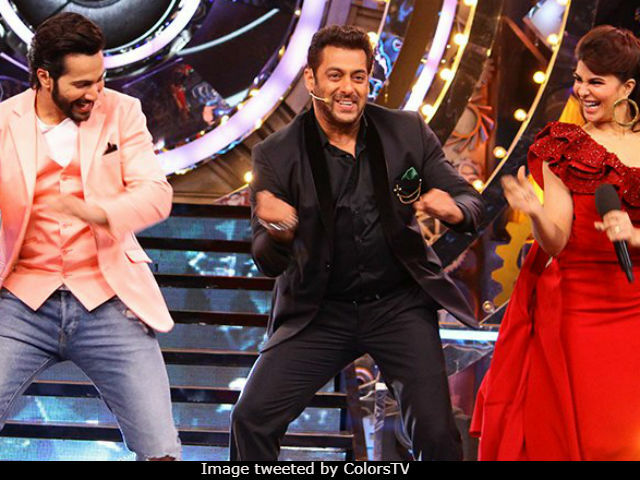 The wait for Salman Khan and the Bigg Boss 11 grand premiere ended on Sunday evening with a blockbuster episode of the much awaited reality show. "Badal gaya hai, badal gaya hai, saab kuchh badal gaya hai!," is all Salman said while cycling his way on to the stage. Another one-liner from Salman - "Jaise humara population grow ho raha hai, waise hi humara popularity grow ho raha hai," - summed up the TRP reports of the show in one sentence. Salman means dancing shancing toh banta hai boss! - he grooved to revamped versions of his popular tracks, from Didi Tera Devar Deewana to Hangover. On a subtle note, Salman also addressed rumours about his Rs 11 crore salary, which is speculated to be his fee for each episode of Bigg Boss. Salman also plugged in Judwaa 2 promotions with Varun Dhawan, Jacqueline Fernandez and Taapsee Pannu giving us a sneak peek of the beautifully decorated house. They set the floor on fire with the viral Judwaa 2 tracks Tan Tana Tan Tan Tan Tara and Oonch Hai Building 2.0. Team Judwaa 2 also joined Salman on stage for a fun filled session - Varun even tried to claim a gift sent for Salman and posed as the show host in the superstar's absence. Without much ado, Salman Khan introduced the first contestant - TV actor Hiten Tejwani, who was joined on the sets with his actress wife Gauri Pradhan. The next three contestants were VJs Priyank and Benafshah Soonawalla, and rapper Akash Dadlani. Bandgi Kalra and actress-model Arshi Khan from Mumbai also joined the list of contestants. Puneesh Sharma, an investor and a party animal and Zubair Khan, who is Dawood Ibrahim's sister Haseena Parkar's son-in-law, were also welcomed on the show. TV actress Hina Khan, an ex Khatron Ke Khiladi contestant, also entered the house with her motto being: "girl power!" The list of contestants was rounded off with Bhabiji Ghar Par Hain actress Shilpa Shinde and Vikas Gupta, the show's producer. After Shilpa Shinde quit the show, the two had exchanged allegations in a controversial blame game - a glimpse of which also took place on the stage of Bigg Boss. Salman also introduced the much awaited padosis of the new Bigg Boss season. The padosis will apparently be responsible for wreaking havoc in the lives of the celebrity contestants and they are former Miss World South Australia Lucinda Nicholas Lucinda Nicholas; model and aspiring actor Luv Tyagi; artiste Sabyasachi Satpathy; Mehjabi Siddiqui; Jyoti Kumari, who is a peon's daughter from Bihar; self-proclaimed spiritual guru SsHivani Durga from Noida and dancer Sapna Choudhry from New Delhi. Curtains were drawn on the grand premiere of Bigg Boss with a surprise we all are going to love. For the first time ever, Salman Khan is also placed at a secret location inside the house but the contestants do not know. How do you think the contestants and the padosis will warm up to each other on Monday's episode? Tell us in the comments below.